I can’t tell you guys how excited I am about the changes coming to A Better Story! It’s going to be wonderful fun and an amazing blessing to be a part of, and I’m /almost/ ready to reveal what Lindsey and I have been working on! The operative word is /almost/ because the packing and moving part of our story right now is taking quite a bit of my time. Let me show you a little bit of the progress I’m making though! Ok, I know you can’t tell anything from this picture except that I have a lot of boxes piled in my dining room area, but I promise I’m making progress I can be proud of, people! One week and counting! 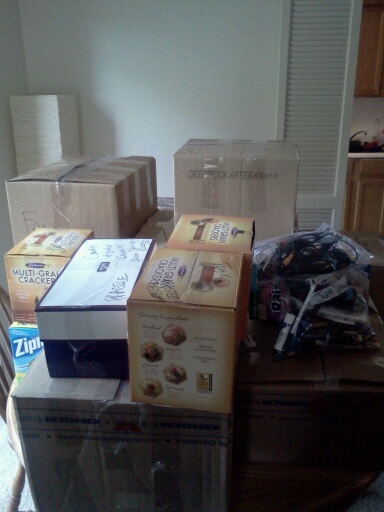 This entry was posted in life, Moving and tagged boxes, excitement, life, moving by TheLaneys. Bookmark the permalink.